The financial crisis has rekindled debates about the legitimacy of the European Union and, in particular, whether citizens trust the EU. Using Eurobarometer data, Eelco Harteveld analyses three possible sources for trust in the EU: rational evaluation, identity and projection. He proposes that as trust continues to decline in governments of all kinds, the strongest predictor of citizen trust in the EU is trust in national government. After being a topic of secondary concern for most of the past few decades, the European Union has moved centre stage in political debates in many of its member states. Increasingly, citizens voice their opinions on the EU – and some of these expressions have not been flattering. It seems self-evident that among those citizens who think that the EU is performing badly, trust in the Union is declining. However, our research shows that citizens’ trust in the European Union – which could be considered a precondition for the Union’s legitimacy – depends only weakly on their evaluation of whether the EU is capable of doing what it’s supposed to do. This is perhaps not as surprising as it might sound. For many of us, it is difficult to separate the ‘European’ and the ‘national’, simply because they are so intertwined. In the EU, decisions are usually taken by member states and European institutions together on the basis of intricate procedures. Confronted with this complex mix of shared responsibilities, the nation state remains the primary point of reference for many. Indeed, citizens’ trust in their national government turns out to be the strongest predictor of trust in the EU, rather than their evaluation of European competence or accountability. This suggests that many Europeans project their feelings about what’s happening nationally on the Union – or, interestingly, that trust might to some extent even be a matter of personality. It is astonishing how quickly the crisis has turned the EU into a trending topic. Every now and then, concerns arise about the legitimacy of the European project. While the crisis forces ‘Europe’ to play an increasingly large role, Europeans themselves do not always appreciate its interference. Herman Van Rompuy, the President of the European Council, even spoke of a ‘trust crisis.’ The member states, he argued, need to make offers to restore the credibility of the Union. If we take a look at public opinion data on the EU, the level of trust in the EU has indeed decreased since the start of the economic crisis in 2008 – in some countries dramatically so. On the other hand, it might be too early to speak of a ‘trust crisis’. In some countries, the level of trust was even lower in the 1990s or the early 2000s. Additionally, it is interesting to note that national governments are generally distrusted (even) more than the EU, as is shown by the graph below. At least, it is clear that trust fluctuates. 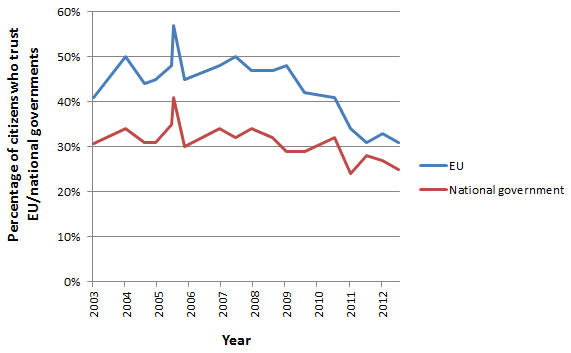 So, why would citizens trust or distrust the European Union? In our research, we have attempted to isolate the sources of trust in the EU. We tried to disentangle three possible explanations by looking at the Eurobarometer study of 2009, a survey among Europeans from all member states. The first possible explanation is that citizens’ trust is the result of a rational evaluation of the EU’s merits in terms of performance and procedures. Indeed, we find that the evaluation of whether the EU is competent can partially explain trust in the EU. The second explanation stresses the emotional side: identity. Most Europeans have a stronger emotional identification with their nation state than with the EU. If it’s all about identity, those citizens with the strongest feeling of national identity should be the least trusting of the EU. However, our research shows that feelings of neither European nor national identities correlate strongly with trust in the EU. While the debate about Europe has a tendency to touch some raw nerves from time to time, rationality rather than identity seems to play the key role. There is a third possible source of trust in the EU – one that is, surprisingly enough, unrelated to the EU itself. Trust might be extrapolated from other sources – what might be termed ‘second-hand trust’. Experiences close at hand tend to shape our thoughts about things we are less knowledgeable of. According to this explanation, the degree to which citizens trust the EU often reflects the extent to which they trust their own state and its officials, which is much closer to many of us than Brussels. Indeed, citizens’ trust in their national institutions is by far the strongest predictor of their trust in the EU. This result holds even if we take the other two factors into account: many citizens who trust their national government also trust the EU, regardless of their evaluation of EU competence or feelings of European identity. This strong association even suggests that, to some extent, trust in the EU depends on personality. Indeed, a trusting inclination – regardless of the object of it – has been shown to be related to a general optimistic stance and to be shaped by experiences early in life. If this is true, citizens’ trust in the EU can still change, but as a part of a more general development in political trust. Indeed, trust in national government is decreasing as well. Of course, we do not know how the economic crisis will affect the fundamental support for and legitimacy of the European project in the long run. The more we talk about and get interested in the EU, the more likely it is that our assessment of it gets untangled from our thoughts about what’s happening domestically. While the national and European arenas become more intertwined than ever, citizens might start to become more specific in whom they trust. Nevertheless, presently, the capacity of the EU to influence citizens’ trust in it seems to be limited. At least, our findings suggest that good performance has a greater chance of giving it a boost than attempts to stimulate a shared European identity. At the same time, this also indicates that the fact that most citizens do not share such a European identity is less of a threat to the legitimacy of the European project than both Eurosceptics and ‘Europhiles’ usually argue. Citizens can be rational about the EU. Still, their trust relies more on what’s happening in national capitals than in Brussels. Eelco Harteveld is a PhD Candidate at the University of Amsterdam. His Research Master’s dissertation ‘In Europe We Trust’ was published in the journal European Union Politics. He was previously an intern at the Netherlands Institute for Social Science Research and he teaches introductory and advanced courses in research methods and statistics at the University of Amsterdam.